Mijente Hosting First Ever National Gathering of Members! What is La Sazonblea de Mijente? 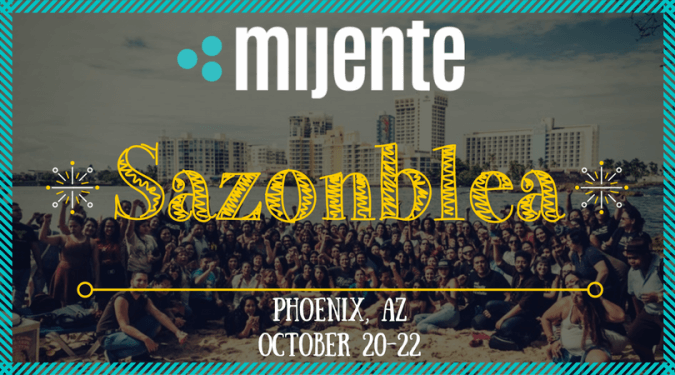 This October 20-22, join us in Phoenix, Arizona for our first official national gathering of Mijente’s membership. Many have joined us at Lánzate, in Chicago in 2015 and/or in San Juan in 2016 – don’t worry, Lánzate is coming in 2018! At Lánzate, we pledged to help build an ecosystem of Latinx and Chicanx change-makers who understand that it takes more from us not just more of us to make transformative change. Some of you have taken the step to formally become a part of Mijente, to build a political home and vehicle towards a pro-Latinx agenda that is pro-organizing, pro-Black, pro-indigenous, pro-queer and trans. We will be coming together to connect, strategize together and build shared vision for the work of Mijente. This is an invitation to help build the infrastructure for our casita–our political home–to grow and expand the familia. La Sazonblea de Mijente will be our space to imagine and prototype the structures and plans we have and those we need, support and develop our constellation of leaders, and begin to season our collective sazon and our story. Mijente was launched to build political home for Latinx and Chicanx organizing that’s URL and IRL (in real life). On a daily basis, from our barrios all the way to the White House, we see all that is needed, all that we face. This October, don’t miss this critical opportunity to re-energize our spirits, co-conspire plans of action, and create nuestra casita. 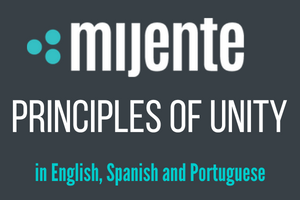 Sign up to become an official Mijente member here. Registration is free but we suggest a $50 donation to cover scholarships for travel and lodging. Please indicate if you’ll need scholarships on your registration form.